Exceptional chefs don't just create great restaurants and great dishes; if they are worth their salt they also generate professional offspring, thereby building there own culinary family tree. In the UK obviously a giant Sequoia chef tree was planted by the Roux family, with chefs with renowned restaurants scattered around the country. Growing right next to it, and yes I believe he deserves his own tree by now, is Gordon Ramsay's tree with a significant offspring of chefs who have ventured out on their own, especially in London, like Marcus Wareing of 2-star Marcus at the Berkeley Hotel, Angela Hartnett of 1-star Murano in Mayfair (amongst other restaurants) but also Jason Atherton, who's very successfully building a culinary family tree of his own and not to forget Paul Ainsworth at No. 6 in Padstow, Cornwall. Clare Smyth (b. 1978) has worked alongside Gordon Ramsay for most of her career. She joined the kitchen team at Gordon Ramsay's flagship restaurant on Royal Hospital Road (Restaurant Gordon Ramsay) in 2002, getting a senior sous-chef position in a few years' time. In 2005 she spent two years working abroad, first at Alain Ducasse's 3-star Le Louis XV in Monaco and later on at Thomas Keller's 3-star Per Se in New York City and The French Laundry in Napa Valley. When Clare returned to the UK she was made head chef at Restaurant Gordon Ramsay. Five years later, in 2013, she became a partner in the restaurant, and thus chef-patron, making her the first and so far only UK female chef to run a 3-star restaurant. 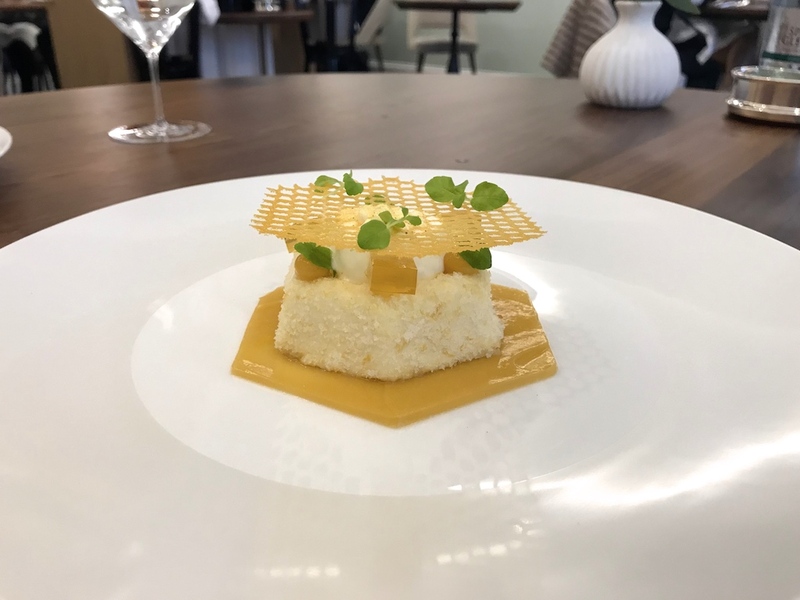 But the chef heart wants what it wants, because in October 2015 it was announced that Clare Smyth would be leaving Gordon Ramsay to open her own restaurant. 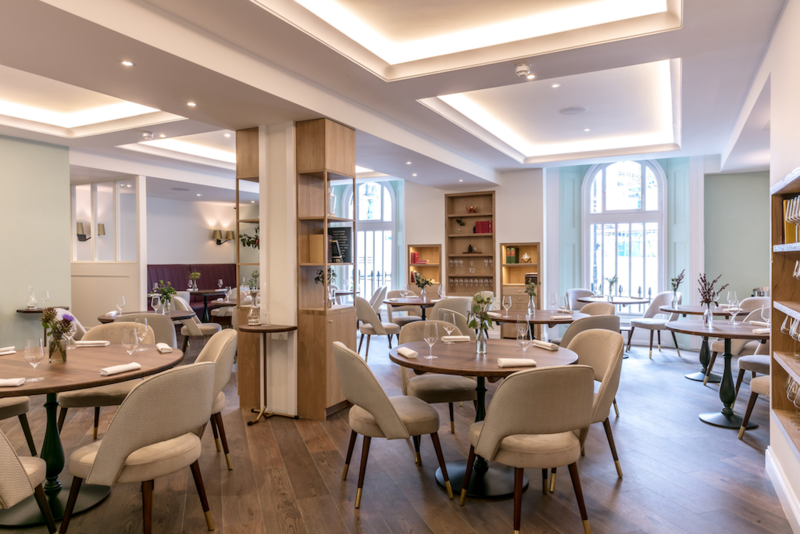 The restaurant was originally scheduled to open in 2016 but this was delayed by a number of setbacks, and it wasn't until August 2017 that the highly anticipated "Core by Clare Smyth" ("Core") opened its doors on Kensington Park Road in Notting Hill. Smyth's head chef is Jonny Bone, who has previously worked in acclaimed kitchens such as Geranium in Copenhagen, Blue Hill at Stone Barns in the USA and of course Restaurant Gordon Ramsay. Core is open for dinner Tuesday through Saturday and for lunch Thursday through Saturday. The restaurant offers 2 multi-course tasting menus (5 courses £85, 8 courses £95) and there's the a la carte menu (lunch 3 courses £65, dinner 3 courses £75). I had lunch with my husband at Core in October 2017 and we both ordered three dishes from the a la carte menu and one extra dish (the Charlotte Potato) to share. Lunch started with four appetisers. 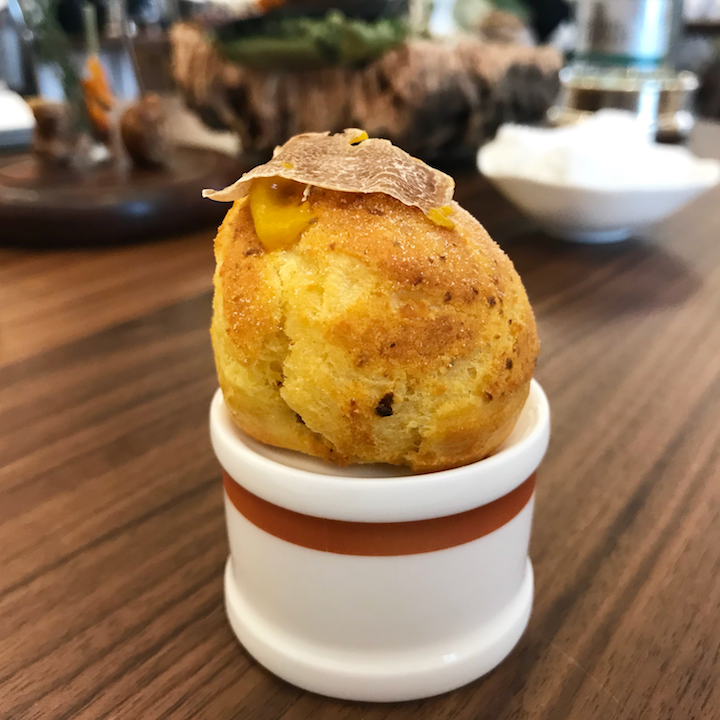 There was a cheese and pumpkin gougère garnished with truffle. A substantial but delicious bite, the gougère having a lovely moist interior. 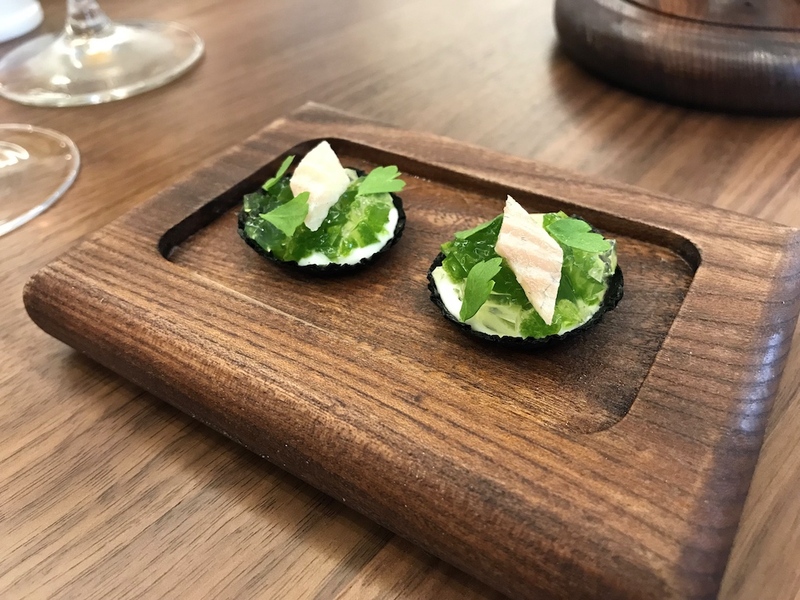 Equally lovely was an elegant take on jellied eel, the (smoked) eel served in a little nori tartlet with eel cream, parsley jelly, and finished with a spray of malt vinegar. 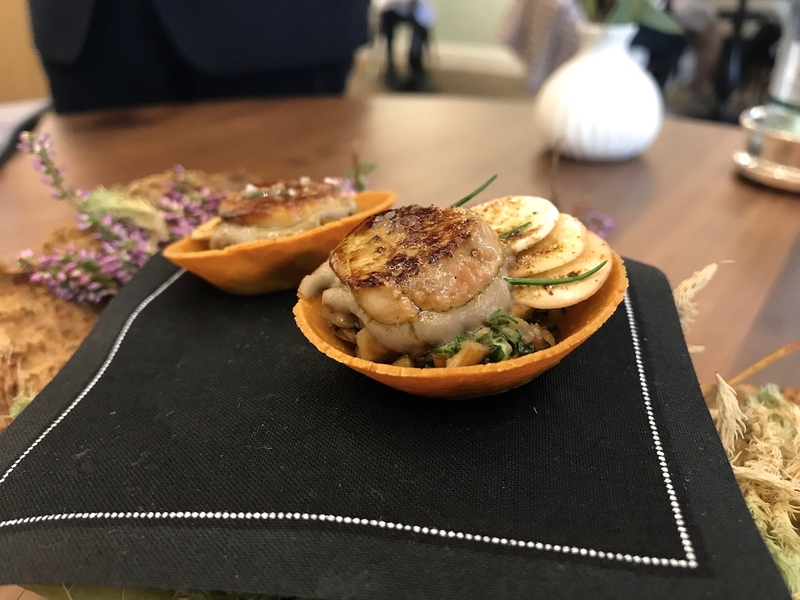 Then there was a piece of duck, fried and smoked with orange and warm spices, served on a little skewer and finally a perfect little cep tart filled with mushroom crème, cep ragu, thinly sliced mushrooms, and a small piece of pan-fried foie gras. An elegantly rich bite with nice and intense mushroom flavours. 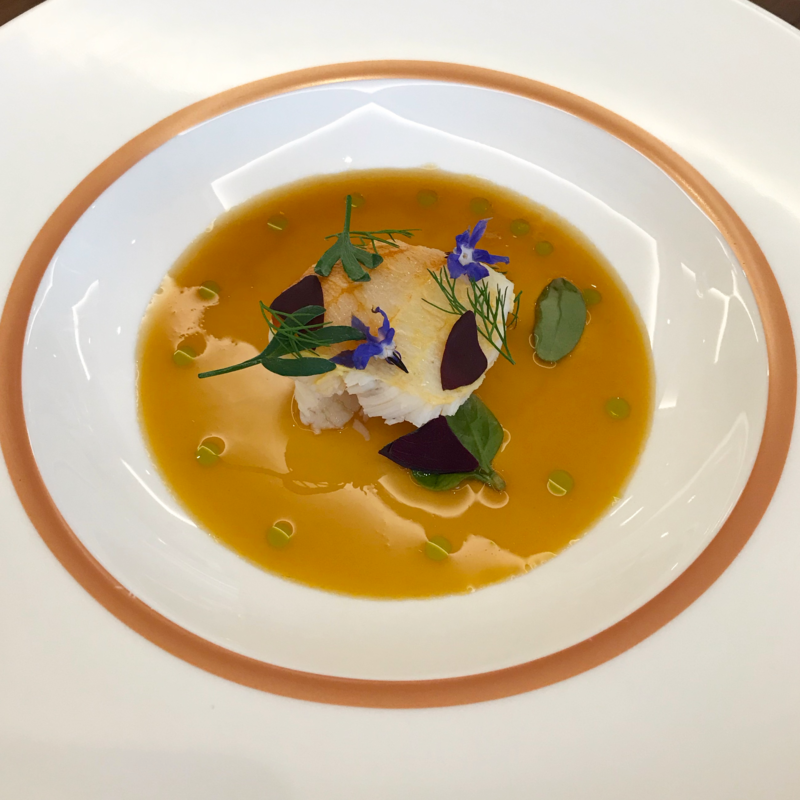 My starter was an excellent, smooth and well-set crab royale, with some concentrated brown crab meat consommé spooned over. Perched on top of the royale was a big chunk of steamed Colchester crab meat, which was exquisite. 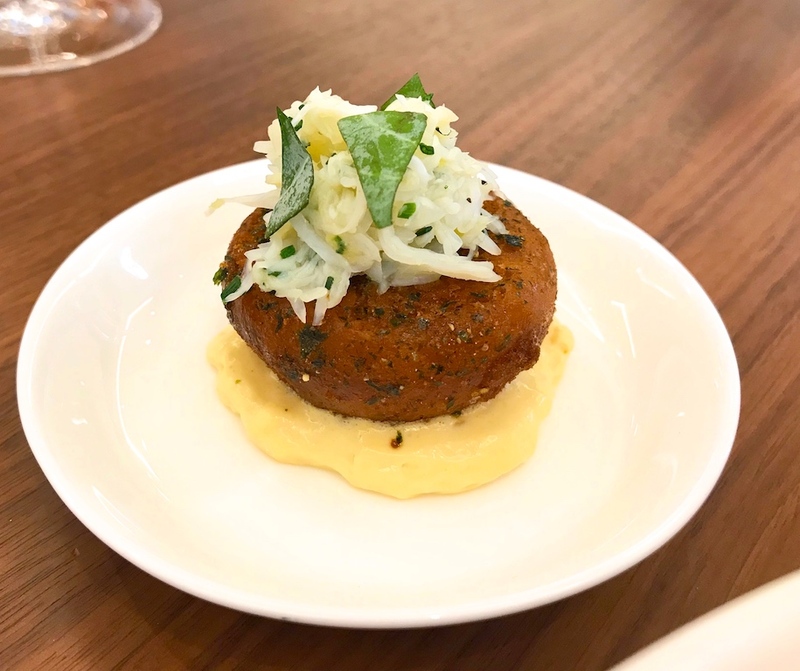 Served alongside the royale was a crab doughnut topped with fresh white crab meat and placed on top of a delicious crab sabayon. The doughnut was gorgeous, striking the perfect balance between characteristic doughnut and crab flavours. 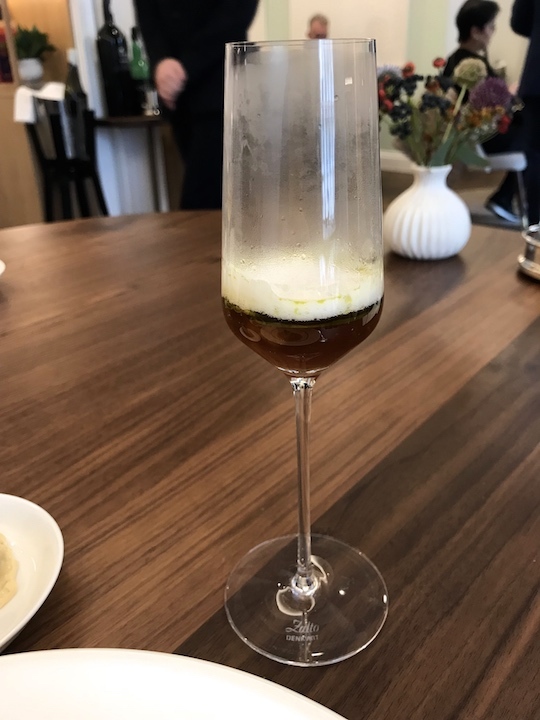 A bit disappointing though, was a small glass of crab consommé topped with lime foam, the consommé being to delicate and failing to add something to the royale and doughnut duo. 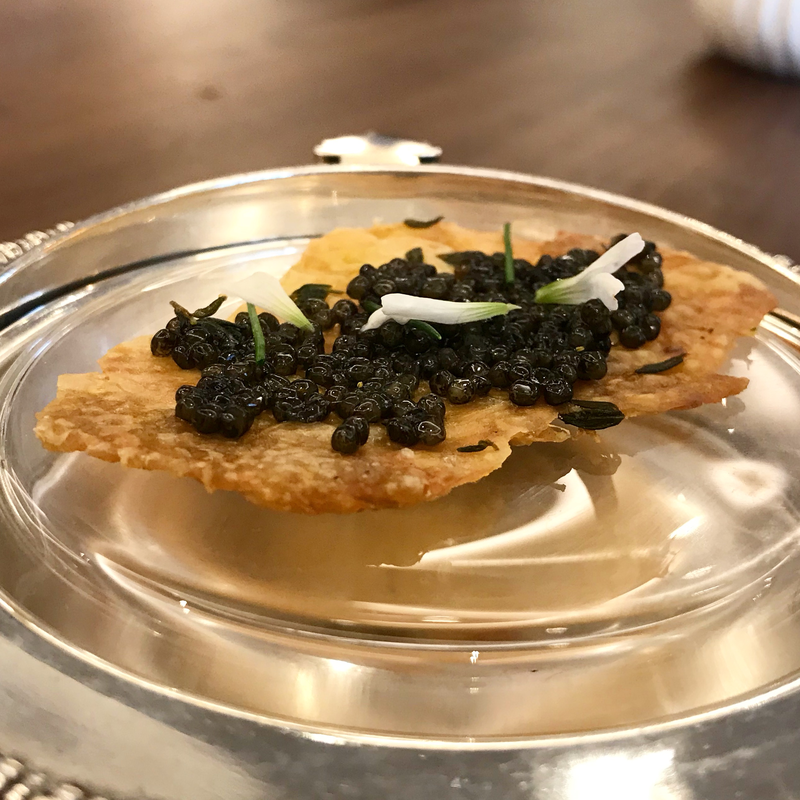 Next up was skin-on Charlotte potato attractively and diligently decorated with a blend of glimmering trout roe and herring caviar and mini potato crisps. 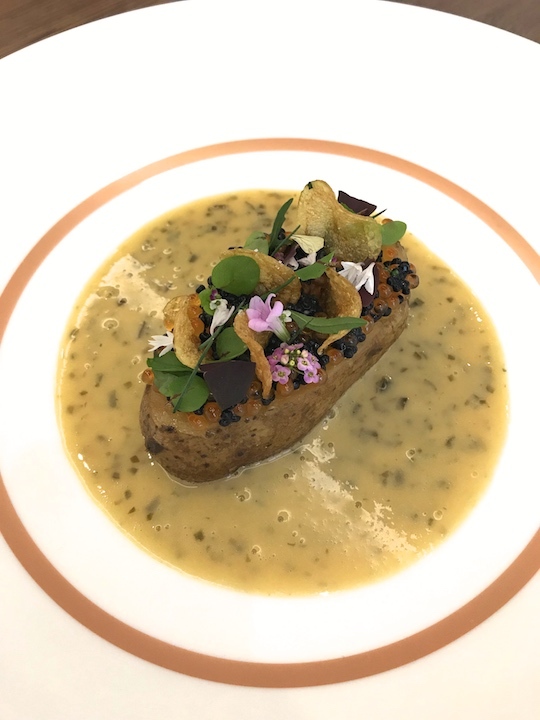 Best of all though, was a truly glorious dulse beurre blanc, which had a beautiful velvety texture and was pleasingly buttery, the dulse adding substance and balance. 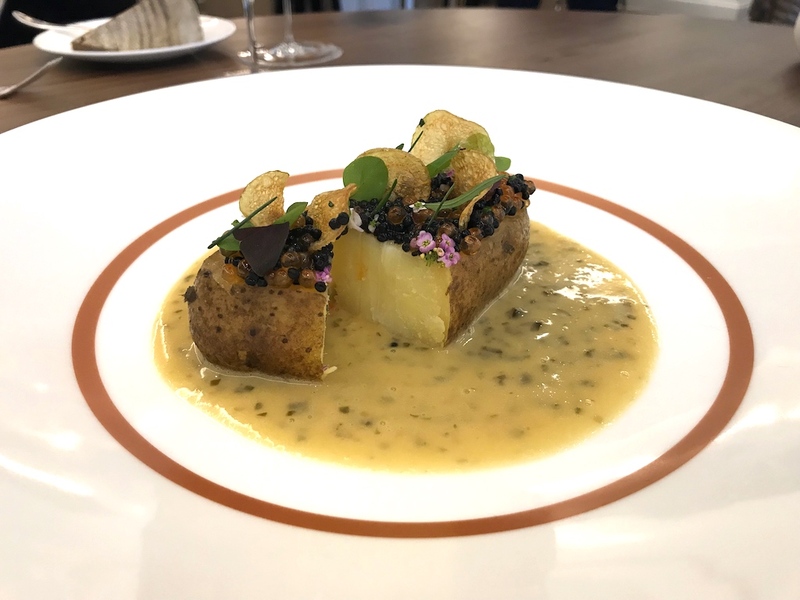 The potato was soft but had retained a little bite and its natural fresh flavours were wonderfully enhanced by the saltiness of the roe and caviar, but particularly by the dulse beurre blanc, the butteriness and mild smokiness of the sauce bringing out the best in the potato. My main course was expertly cooked 120-days chicken from free-range poultry farm St Brides in Scotland, garnished with caviar, and accompanied by tasty cockles and razor clams, a terrific, deeply flavoured chicken jus, and thin sheets of kohlrabi, rolled up into perfect little rolls, and given a charred finish. 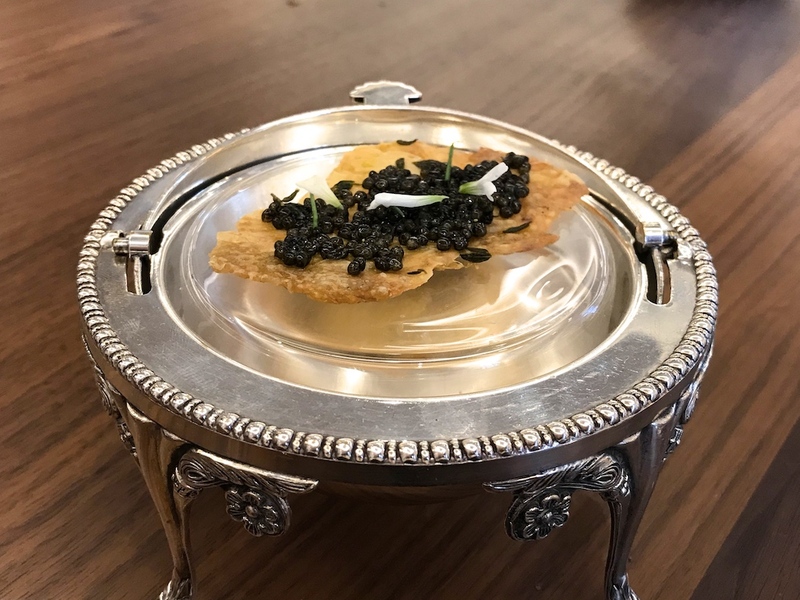 Served on a dainty little serving dish on the side was a thin piece of crisp chicken skin topped with caviar. Chicken and clams is a wonderful pairing which I have enjoyed e.g. 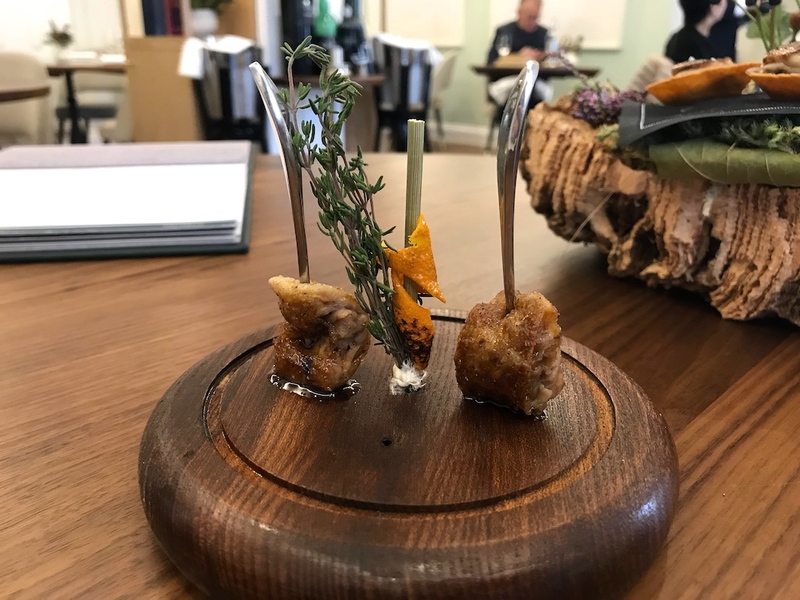 in Spain, and I've heard about (but sadly not experienced) Wylie Dufresne's and David Chang's fried chicken and caviar. The combination of all three, of chicken, clams and caviar was a first for me, yet it seemed very natural. 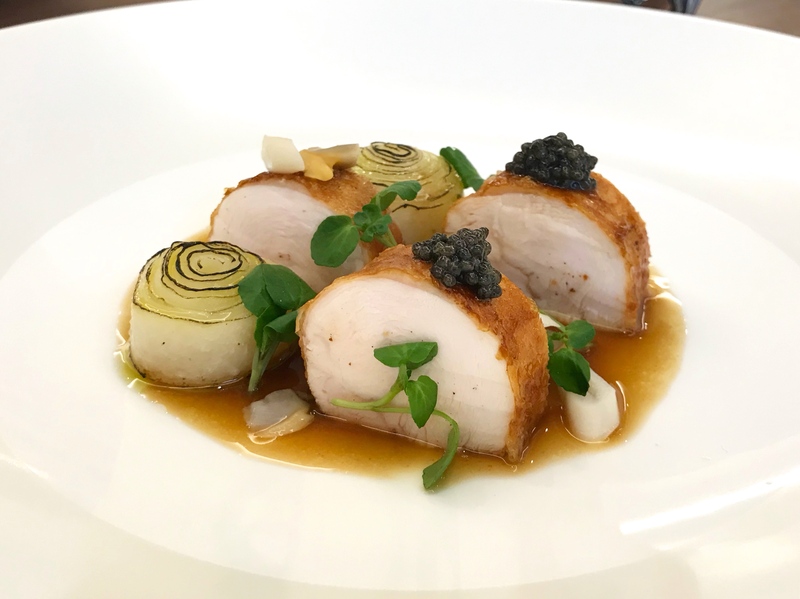 Impeccable chicken with excellent, delicately moist meat with an almost silky texture, and an elegantly salty skin, the flavours marrying beautifully with the marine saltiness of the clams and caviar. Last, but certainly not least, the chicken jus which was packed with flavour and had the just right little note of bone gelatinousness. Pre-dessert was an elegant take on a cherry bakewell tart. 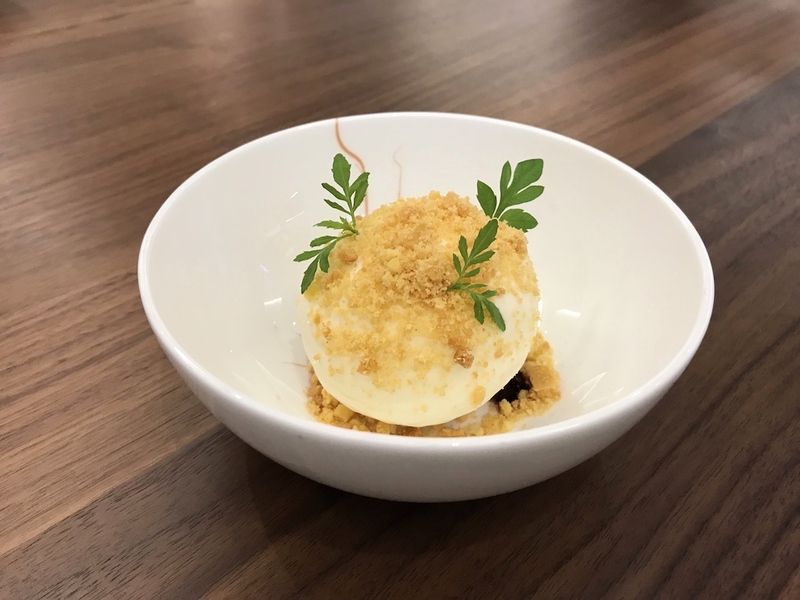 Served in a little bowl were chopped fresh cherries, a smooth and fruity cherry sorbet, a light almond foam, and some buttery crumbs for extra texture. A delightful little dessert. This was followed by a fetchingly presented dessert of a vibrant and tingly lemonade parfait, topped with a lemon (and yoghurt?) 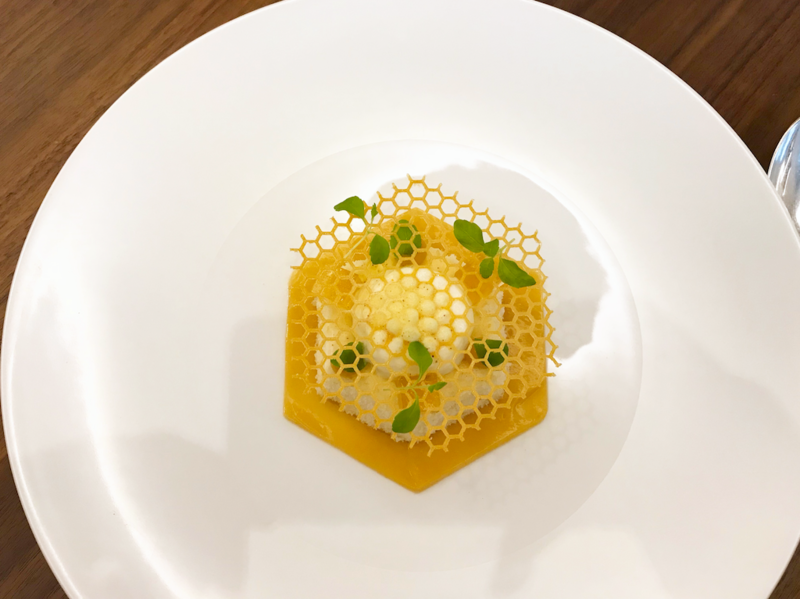 foam, little cubes of honey jelly, and a beautifully made, sugary honeycomb. Underneath the parfait was a glossy lemon and honey flavoured puree. Essentially this was a good dessert but it was let down by the lemon and honey puree, which failed on two accounts. Firstly, the honey and lemon flavours were both too strong, the honey also leaving a cloying mouthfeel, which I don't think the chef was aiming for. Secondly, there was just too much puree on the plate and this threw the dish off-kilter. Obviously expectations run high for a restaurant from someone as qualified and experienced as Clare Smyth and of course there's the temptation of comparing her cooking at Core with her cooking at Gordon Ramsay's. She has already proven to be a good restaurateur and chef throughout her years at Royal Hospital Road, but this is a new chapter and a new road, Kensington Park Road. I wasn't disappointed. Today's dishes showed some outstanding culinary skill, particularly the chicken main course, and the dulse beurre blanc, which was an absolute triumph. It's pretty hard to fault the food, but overall the flavours were more on the conservative side of the spectrum, and however expertly executed this meal was, I did feel that some of the dishes could gain by more complexity, more intricacy, and an element of surprise here and there. That being said, delivering this excellent level of cooking with a new team, in a new kitchen, within 10 weeks after opening is quite an achievement. Service was eager and friendly. The shiny new dining room could do with a little more atmosphere and buzz, but shiny new dining rooms always do. I'm positive that Core, as the famous phrase goes, "will ride up with wear".